There is an unmistakable charm about the candy-coloured buildings scattered around the islands of São Tomé and Príncipe; and an equally inimitable heat, pulsing and fierce, that shines down throughout the seasons. 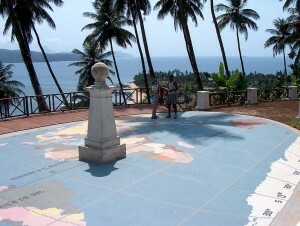 In front of a gorgeous vista of azure waters, a promenade on São Tomé features an unusual sight – a globe carefully painted on the brick terrace, with a heavy stone marker planted over the equator. The island may actually be just a fraction of a degree north, rather than directly on the meridian – but with all its blissful sun and a 27C average temperature, does it really matter? These isles, offshore of the politically-stable country of Gabon, are truly a cultural melange; the official language is Portuguese, the cuisine and laid-back attitudes are distinctly Caribbean, and a vibrant African heart beats within the islands’ communities. This beautiful, lush paradise has been largely untapped by holiday developments, however, this may be set to change. The adorably-named Bom Bom Island, found off the northern shore of Principe, has brought a new era of luxury to the country’s tourism sector – with a decidedly eco-friendly twist. 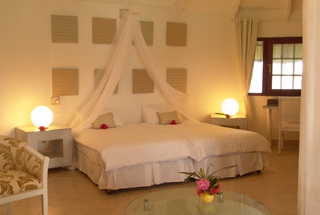 The island holds just 21 bungalows, each offering modern amenities and a breezy, tropical feel. 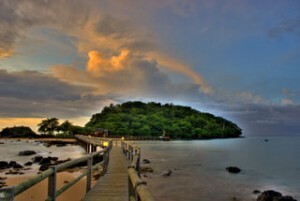 While the air-conditioning and airy white décor may be a cool temptation, guests will likely not spend much time in their suites – the resort offers a unique restaurant and bar on a smaller islet connected by a pathway, a dive centre for exploring the wonders of the nearby reefs, and two stunning private beaches. Proceeds from tourism at the resort, and another mainland lodge, go towards a broad vision of conservation. The director of the resort, which is part of a greater operation known as Africa’s Eden, is Rombout Swanborn, a native of the Netherlands who spent much of his childhood in Gabon while his father was stationed in the country working for Dutch Shell. According to resort media contact Arina Alverina, his early experiences in West Africa laid the framework for his plans to preserve the region’s unspoiled forests and rare wildlife. 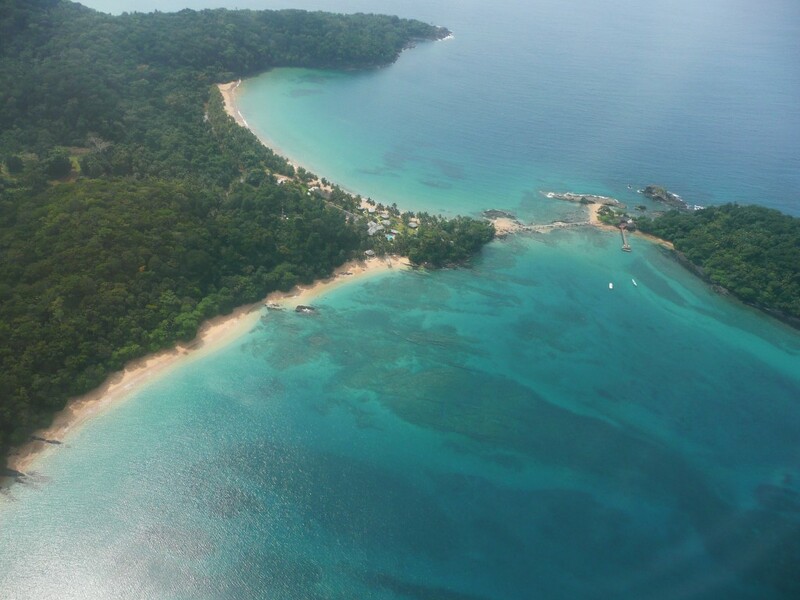 According to Ms. Alverina, the decision to expand the organization’s Gabon eco-safari tours to São Tomé and Príncipe in 2006 is part of an ongoing effort to finance conservation and raise the profile of West Africa by creating exclusive boutique resorts. The benefits are two-fold; Africa’s Eden promotes ecological awareness through carefully-managed safaris and tours, and the proceeds fund initiatives managed by the conservation branch, the SCD. These include, among others, projects to conserve the habitat of lowland gorillas and funding academic expeditions to catalogue the diverse marine life in the Gulf of Guinea. 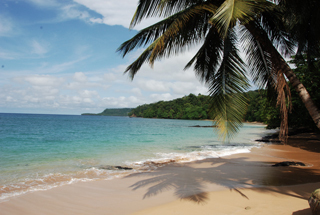 In the general context of African, São Tomé and Príncipe can be considered fortunate; the islands are haunted by a dark history of slavery and brutal plantations, but have largely escaped modern bloodshed and political instability. The potential for tourism is huge, although this rare place will likely never be the site of massive commercial resorts – and nor should it. The best path forward is exactly what Africa’s Eden promotes – sustainable development that compliments, rather than competes, with conservation.